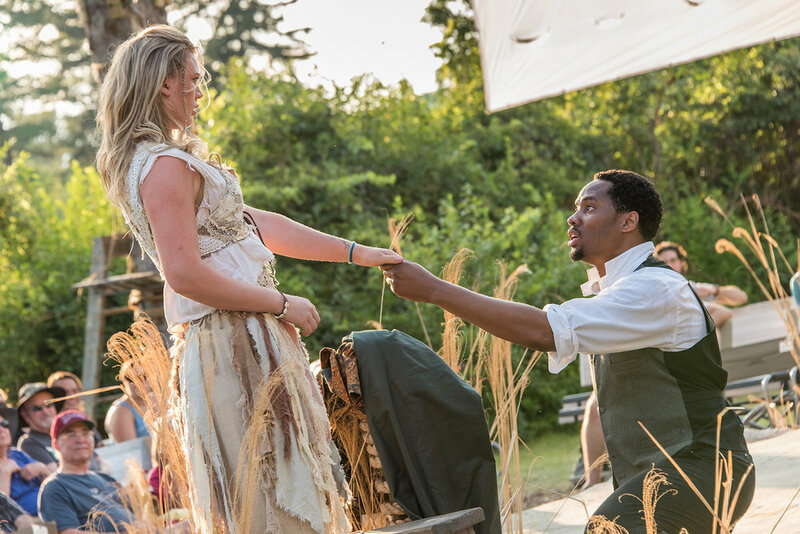 This production of The Tempest was the first show presented in Shakespeare & Company’s Roman Garden Theatre - an intimate outdoor venue seated in the round. Conceptually, the production set the story in the 1890s and used the islands off the coast of Nova Scotia as a reference. The overall design of the show involved embracing the natural space as part of the world of the show including the trees, bushes, nearby field, and the old, decaying building abutting one side of the space. In the spirit of embracing the space, I designed a sound system incorporating speakers hidden around the stage and speakers in and around the surrounding bushes, trees, and buildings. These positions, along with careful audio processing, allowed me to play sounds that appeared to come from the air onstage, from specific locations around the garden, or even to seem to be floating in from a distance across the open field on one side of the garden. Thus I was able to blend my design naturally into the world the audience was in while also supporting the sense of magic and wonder of the island. “The isle is full of noises.” I created world of sounds to show the island as a sort of living symbiosis of it’s own - a place where ancient spirits are part of the very fabric of the earth, air, and trees. My sonic palette was multi-faceted: Loon-call-like ocarina melodies inspired by the northern setting and ancient instruments bridged a sense of the natural and supernatural; Delicate wind chimes inspired by Ariel, the air spirit; Clicks and clatters emerging from the surrounding space representing the countless unseen spirits of the island. Much of the time, these were cued in relation to actions of Ariel - the spirits of the island reacting to one of their own. Often they would also be played on the threshold of awareness of the audience, thereby creating new rules about how the world around them worked without drawing so much attention that immersion is broken. I used music to not only support the period and location of the story, but also to support a dichotomy of those of the island (the spirit Ariel, native inhabitant Caliban, and a sense of the living island itself) and the newly arrived Europeans (including the usurping Duke Antonio and his fellow nobles as well as the clowns Stephano and Trinculo). For the European ‘non-islander’ characters, period songs of the Canadian maritime and logging traditions were chosen, both as inspiration for the original song settings I created, and as a source for traditional songs we added for characters to sing as they wandered the island. Below is a demo recording in my voice of the song setting I created for one of Stephano’s songs. A hybrid of these two ideas is represented in the musical scoring I created for the Duke Antonio, King Alonso, and their entourage. This music was imagined as the response of the island spirits to these usurpers. Violin is used in a nod to their European origins, but the music is airy, abstracted, and foreboding as the island spirits react warily and hostilely towards them.